Ive been painting for over 25 years while bringing up my family of 5 children. They are all grown up now which allows me to paint full time. While bringing up my family I tended to paint quickly as I had limited time, but now I spend more time on something sometimes adding many layers. Ive always loved the outdoors, growing up in the country on a dairy farm and doing lots of great walks throughout New Zealand. My ideal holiday is to go tramping and to take my paints with me, I love to paint enpleinair (outdoors) wherever I can. I also love gardening, pottery, music and animals, especially my cats, we have 7 at the moment, mostly because we kept a litter that my kids couldn’t part with. 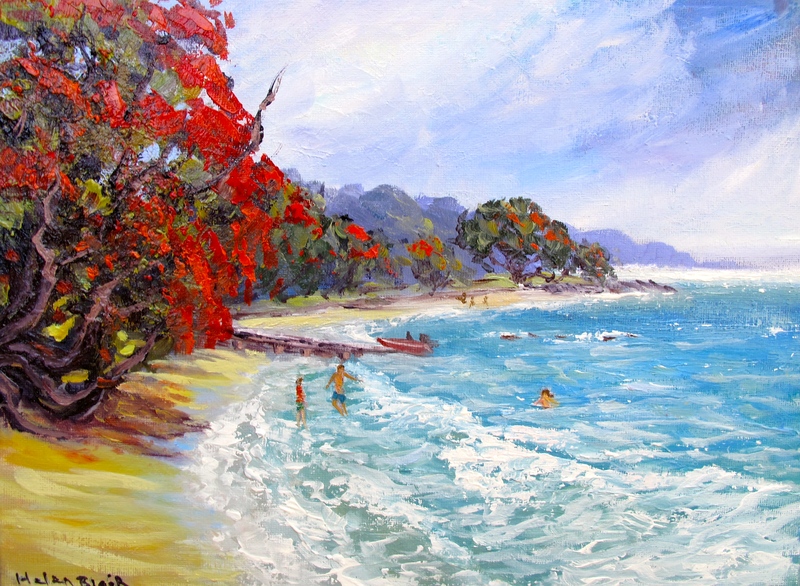 Some of my work is directly inspired by my environment, while other pieces depict my travels and outdoor work. 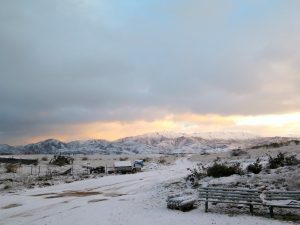 My studio is in a barn on a mountain prairie below Leaning Rock mountain, it is so beautiful here, theres so much variety and change in the seasons. We are currently growing a lavender farm. I love Colour! impasto and to paint loose, strong contrasting works imbued with light and energy. 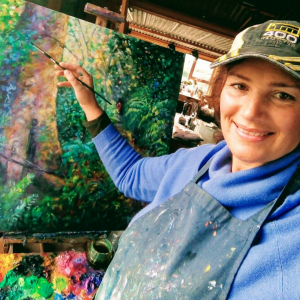 I love to use painting knifes which has a textural impasto paint style and loose brush work to soften areas, revealing layers of subtle colour underneath, sometimes building up many layers, this gives my paintings a blended and sharp effect, and a sense of movement which reflects more light. Do you paint from a photograph or life? I paint from both! I love photography and often Im outdoors taking photos, I also love to paint outdoors amongst the beautiful mountain landscapes, rivers and lakes we have in the area. The photos I use are for reference only, mostly Im painting from memory. Why do you paint with a pallet knife? 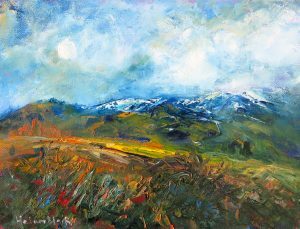 It all started when I first began painting 25 years ago, I was using brushes and found I got too focused on the details and I found by using the palette knife I was looser, I had more emotion and passion in my work. The palette knife gives me an amazing feeling of freedom! 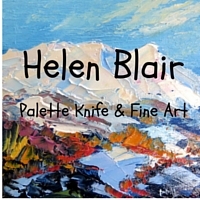 Yes I do, you are very welcome to ask me for a commission piece and custom orders, just email me, www.helensblairsartnz.co.nz, you can attach an image of what you have in mind to start with, commission prices are similar to my regular painting prices. It can take up to a few weeks or more depending on the size and then a few weeks to dry fully. It is painted on the sides ready to hang, signed by me and comes with a certificate of authenticity. How does painting make me feel and what makes me create art? Seeing this beautiful earth, I feel so much love for and everyday I am inspired to paint it! 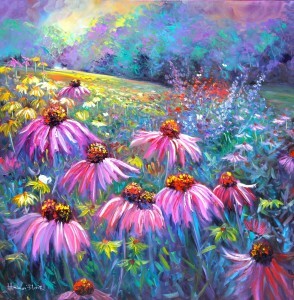 I often imagine how I will paint something, the strokes and colours, the composition, It makes me feel alive and complete! it also takes me into a world of calmness and at peace which has helped me to be able to deal with the outer stresses of life, its an amazing and satisfying feeling to put paint onto canvas. I love colour and strive to put energy and passion into my work, I like to give people a feeling of connection, to be drawn into it by the contrasts of light and colour and a sense of movement. I am constantly evolving as an artist, one of the best things about being a professional artist is that I am able to make a living out of something I love to do every day, this is an amazing liberating feeling along with the joy of being able to touch people with my art. 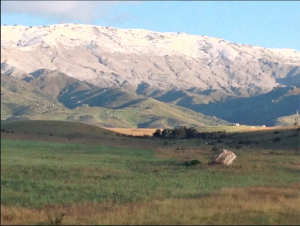 Nearly 3 years ago I moved 10 kms north of Alexandra, Central Otago, where I am living amongst the mountains. Art Prints were sent in 2014/2015 and people have loved them.